Photo by Ansley Thomas / On saxophone, Lalli provides a more fluid compliment to the beat-based vibes of Slaken, creating a firm yet dynamic sound. A group that combines electronic beats with live saxophone and drums, Big Gigantic is a rare act in today’s music industry. Formed in Boulder, Colorado, the duo consists of saxophonist/producer Dominic Lalli and drummer Jeremy Salken. After graduating with a Masters degree in jazz at the Manhattan School of Music, Lalli relocated to Boulder and began performing with Salken, creating the phenomenon that is Big G. The masterful duo began receiving positive feedback in the late 2000s with small, local shows before releasing their debut album, Fire It Up, in 2009 and embarking on a full US tour. 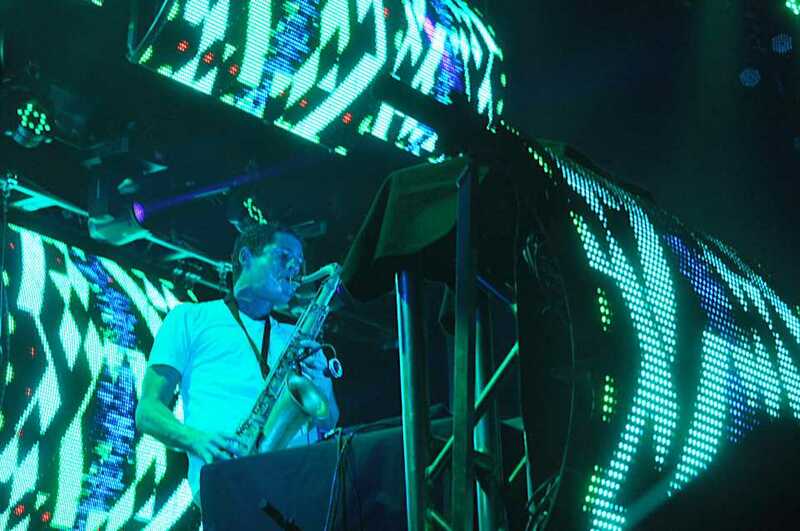 Big Gigantic has evolved into a must-see performance. After performing at numerous music festivals, Big Gigantic has evolved into a must-see performance. Big G’s live shows are the epitome of ingenious improvisation and tight-knit chemistry between Salken and Lalli. With their sold out show at the Tabernacle on Feb. 1, they lived up to their reputation and more. The set began with a crowd favorite, “It’s Going Down.” Throughout the performance, Big G kept the crowd on its feet, swaying to the melodic sounds that pierced through the venue. A wonderful mix of songs were performed, including a variety of selections from both albums A Place Behind the Moon and Nocturnal. Besides the music, the most incredible aspect of the show was without a doubt the stage set up. It consisted of several LCD screens that displayed lights and images correlating to the beats and music. At one point in the show a giant game of Pac-Man was projected onto the screen; this gained a huge crowed response. The combination of Lalli and Salken’s talents are genuinely brilliant, with their mix of thoughtful melodic tunes with pulsating dance beats. Big Gigantic is a one-of-a-kind in the electronic music scene, with beautiful sax solos and soulful synth lines as well as the incorporation of feisty beats. For those that missed Big Gigantic’s show last Friday, do not worry. The duo is sure to be around for a long time with their unique performances. They already have many music festivals and concerts lined up for the year, such as Buku, Ultra, etc. Be sure to check them out because Big G it is an unforgettable musical experience.